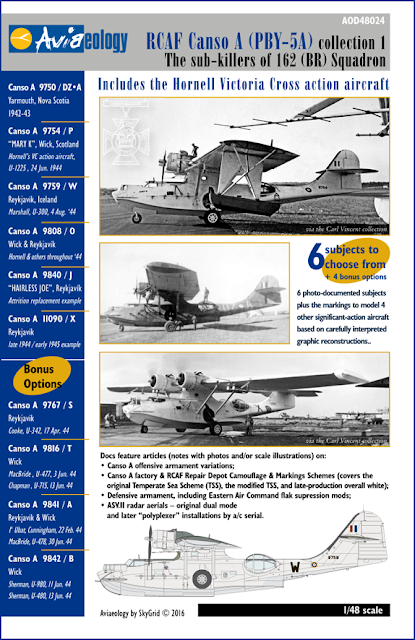 1_72_aircraft_news 1/72 1/72 kits Aviaeology Decals incoming .:Aviaeology:. 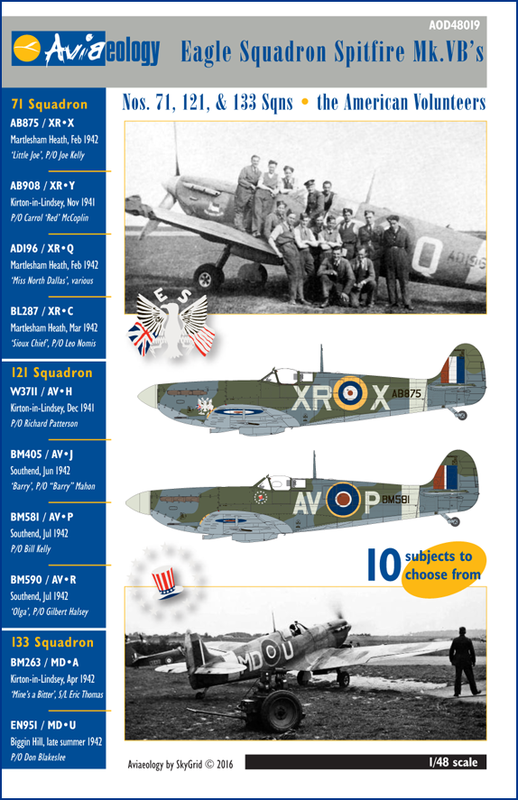 Eagle Squadrons Spitfires & killer Catalina^s #decals. .:Aviaeology:. Eagle Squadrons Spitfires & killer Catalina^s #decals. > Canso A 9750 / DZ*A, Yarmouth, Nova Scotia, 1942-43 - representative of a Consolidated-built Canso A in the Squadron's initial Eastern Air Command finish and markings scheme. > Canso A 9754 / P, "MARY K", Wick, Scotland - U-1225 sunk but aircraft lost with some fatalities, 24 June 1944 - F/L Hornell's Victoria Cross action aircraft - one of the earliest Boeing Canada-built Canso As on squadron. Besides the VC, other awards as a result of this action included a DSO, 2 DFCs, 2 DFMs, and 2 MiDs. > Canso A 9759 / W Reykjavík, Iceland - F/O Marshall & crew , U-300 damaged during extended Ubat, 4 August 1944. > Canso A 9840 / J, "HAIRLESS JOE"- Reykjavík - a representative Canadian Vickers built attrition replacement aircraft (received after the June/July Ubat losses). > Canso A 11090 / X, Reykjavík - late 1944 / early 1945 - representative of the late Canadian Vickers built, ASV polyplexer-equipped Canso As received during the last phase of the Squadron's ops from Iceland. > Canso A 9767 / S, Reykjavík - F/O Cooke & crew, U-342 sunk, 17 April 1944 - action resulted in multiple DFC & MiD awards. > Canso A 9816 / T, Wick - F/L MacBride & crew, U-477 sunk, 3 June 1944 / 9816 was also used by W/C Chapman & crew, U-715 sunk, 13 June 1944 - aircraft shot down during battle, with some fatalities. Action resulted in awards of a DSO, multiple DFCs, and a DFM. > Canso A 9841 / A, Reykjavík & Wick - the squadron's first Ubat recorded while based outside of Canada, F/L Cunningham (U-boat escaped), 22 February 1944 - multiple DFC action / 9841 was also later used by F/L MacBride & crew, U-478 sunk (a shared victory), 30 June 1944, a triple DFC action. > Canso A 9842 / B, Wick - F/O Sherman & crew, U-980 sunk, 11 June 1944, and again during U-480 Ubat on 13 June 1944 when the aircraft was shot down with the loss of all of the crew.